This blog post is sponsored by Behr Paint . Today we are SO excited to be working with Behr on some super cool paint projects inspired by their Colour of the Year, Blueprint S470-S! We love this colour not only for its uplifting and timeless vibes, but also because it fits so beautifully with a bunch of the other colours in Behr’s colour range. If you’re not feeling like putting in the work to choose colours that fit with Blueprint, they’ve also created four STUNNING colour palettes centered around the colour of the year to make DIYing super easy. If you want to check out Behr Paint's range of products, hop on over to www.behr.com + check out their amazing Colour Trends, OR hop over to your local Home Depot! Anyways… enough talking about the paints, let’s get to using them! Today we’re going to show you guys how to transform a space using the ever trendy “accent wall” in two fresh and bold ways! We’re also going to pair each room with a bit of a mini makeover to finish off the fresh new looks! Click here to check out Kelsey’s bold accent wall and room transformation! I have this room in my house that is technically a guest bedroom, but i’ve kind of turned it into my personal closet/getting ready space. The basic furniture in the room is totally the vibe i’m going for, but i’ve been really struggling to see past the ~interesting~ powder blue colour on the walls. 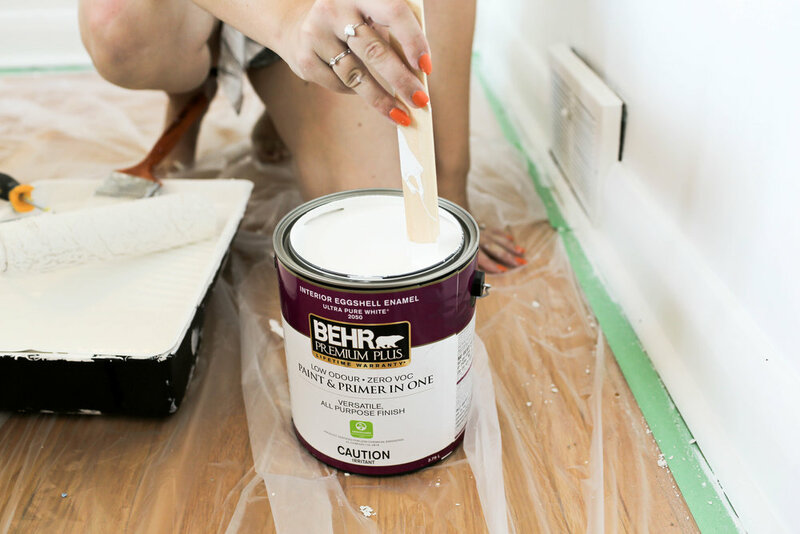 I’m super excited to finally warm up the space with some fresh BEHR ® paint and a really warm and soft ombre effect on a feature wall! I’m also planning to give the room a bit of a facelift with a new rug, some new pillows, and lovely plants (+ totally incorporating the Colour of the Year, Blueprint!). Here’s how I got the look! The first step to any paint project is to choose your colour! I popped onto the ColourSmart® colour selection tool and looked for a colour that would look awesome with the Colour of the Year, Blueprint, that we’ll totally be incorporating into the room. You can check out the ColourSmart colour selection tool here! Next, remove anything from the wall that might get in your way (like decor + light switch covers) and make sure your wall is clean and doesn’t have any damages! Next, open up your BEHR paints and give them a good stir to make sure all of the colour is incorporated into the paint! We are going to start by painting the walls in the room using Behr's Polar Bear 75 shade. Start by painting all of the outside edges of the wall, along the painter’s tape we applied earlier. Paint the corners as well. 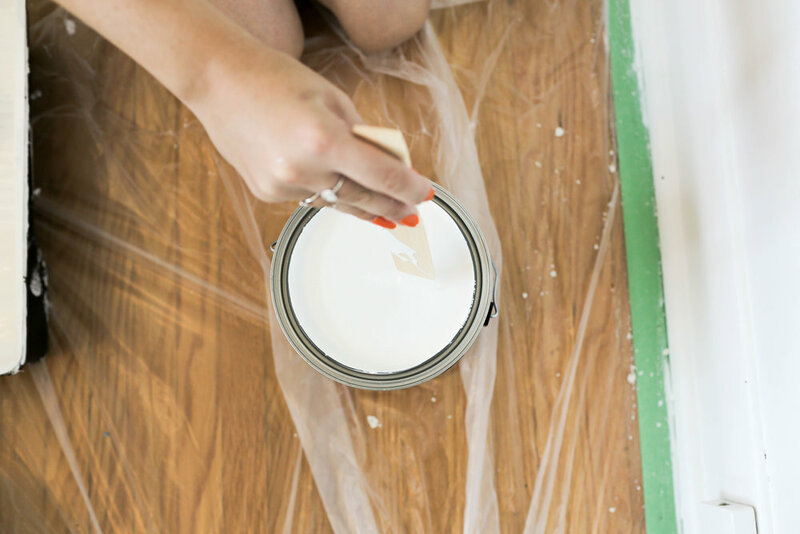 Using a brush with dampened bristles, load up your paint onto the brush and move slowly along all of your edges! This is called cutting in. Next, load up a slightly damp foam roller with paint. Starting on the top edge of your wall next to where you cut in, and roll your roller in a ‘W’ shape (working in one small 3x3 area at a time). Continue this until your wall is complete. Allow this to fully dry before moving on. Time for the fun part, we’re going to start creating the ombre effect on one of the walls! We started by painting the entire accent wall with the lighter colour of the ombre, we decided to use BEHR’s Cotton Grey. We, of course, used the technique from earlier for the best finish! Next, we grabbed our darker colour and applied that to the bottom half of the wall, over the first colour. On our wall, we are using BEHR’s Sand Dance. In a separate container, I mixed Cotton Grey and Sand Dance together. This new colour is what we are going to use to blend the Cotton Grey and the Sand Dance that is already on our wall. Load up a clean foam roller with this new colour, and roll along the seam between the two colours on the wall. As you are doing this, feel free to go back in with the top or bottom colour to adjust the look of the ombre. Once you are mostly happy with the look of the wall, grab a clean foam roller and run it over the ombre. This helps blur and soften the lines even further! And that’s it! Gently remove your painters tape. If the paint is water based, remove the tape before the paint is fully dry! Allow to fully dry if the paint is oil based. If the paint is fully dry, go ahead and score along the seam of the painters tape and pull slowly to release the tape! To finish off the room, we added some new pillows that match Behr’s Colour of the Year, Blueprint! We also added some brand new plant friends to brighten up the space even further! And that’s it! Check out how AMAZING this before and after is! If you’re feeling inspired but don’t really know where to start on your next project, Behr has this super cool and handy colour selection tool! It’s called the ColourSmart by BEHR® tool! You can click here to check it out and try it out yourself! 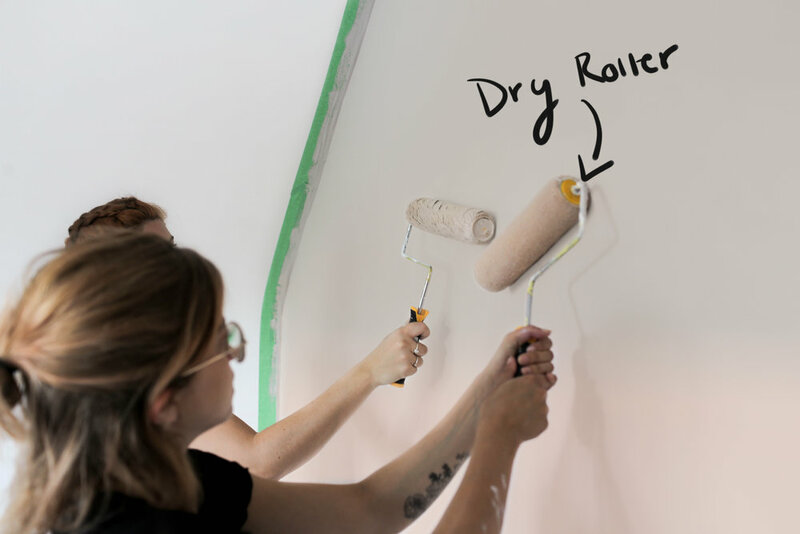 If you guys end up trying out any of these fun accent wall techniques, take some pics of your beautiful work and tag us on Instagram using the hashtag #SorryGirlsSquad! Thank you SO much for reading + we’ll catch you next time!